Who doesn’t like soda? 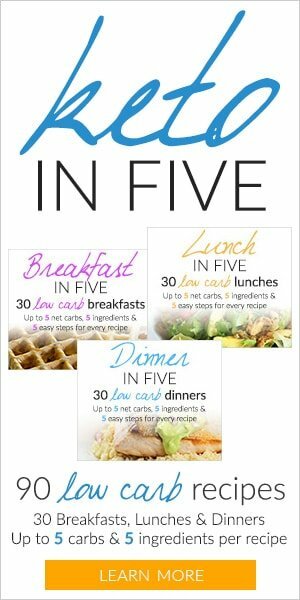 But we all know very well about its harm to our body because of the extra calories, sugar, artificial ingredients. 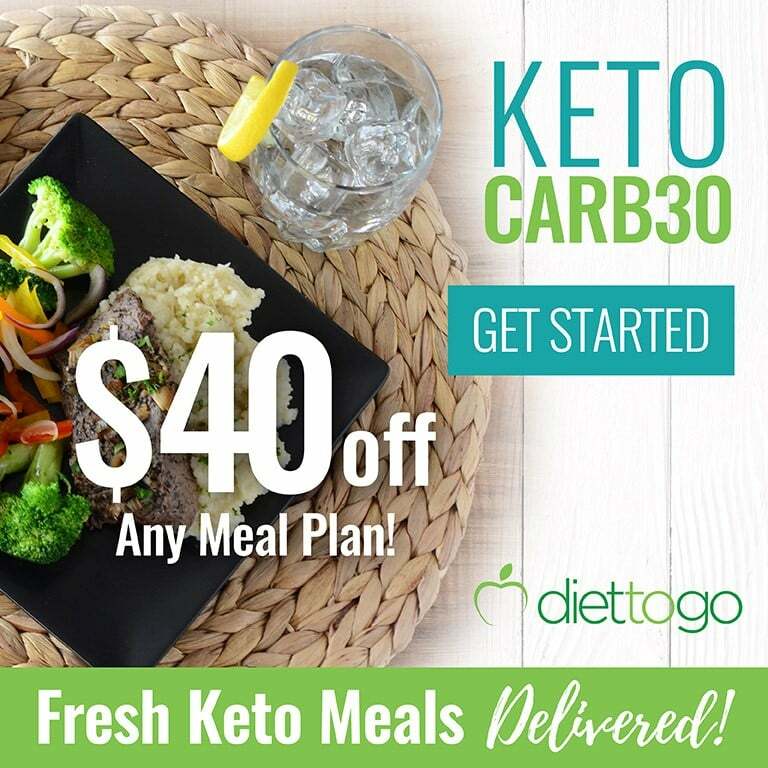 However, you don’t have to give up your soda if you know how to make them low carb and keto-friendly. So, we came up with a unique flavor for you – a soda that doesn’t hurt you and even will benefit, and its taste will make you pleasantly surprised. All we need are just basic carbonated water, ginger, red pepper flakes, lime juice, ginger, collagen powder and sweetener. Chances are you probably haven’t tried this unique soda composition before. It has all the good stuff! 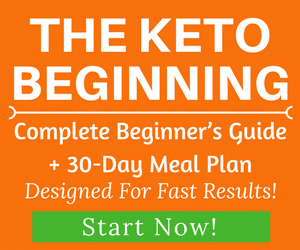 Red pepper flakes that will speed up your metabolism and make it burn your body fat. A little bit of fresh ginger will energize you and tonify the entire body, and will also speed up the fat burning process even more. Ginger has anti-inflammatory effects, lowers blood sugars and helps with chronic indigestion. Also mandatory is the use of collagen, which is simply indispensable for our beauty and health. It helps with muscles and joints building as well as improving the health of our skin, hair, and nails. 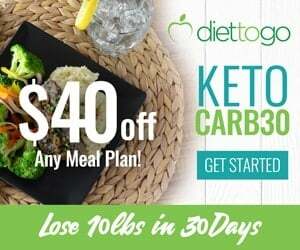 If you’re looking for collagen that is designed specifically for keto diet, Perfect Keto’s Collagen is an excellent choice as it is a completely clean and premium quality doctor-approved product that also has MCTs which helps increase your ketone production. 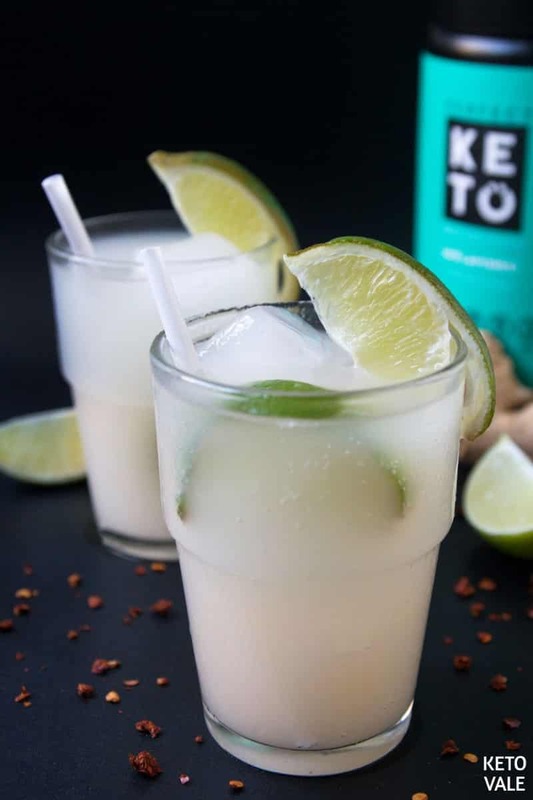 Using erythritol to make sugar-free soda or you can replace it with stevia, as they don’t contain excess calories and are perfectly fine for a keto diet. You can add mint to make the drink fresh or freeze mint in ice cubes, it turns out very tasty, try it! 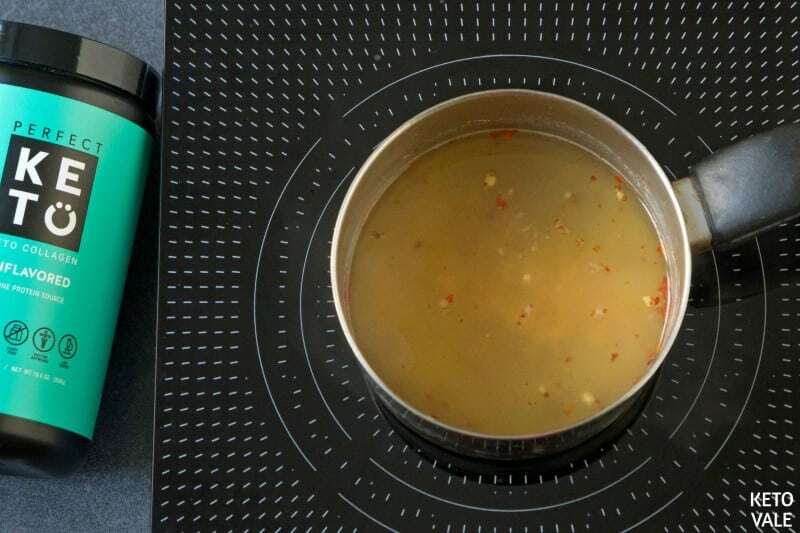 Add water, ginger, red pepper flakes and erythritol in a saucepan and bring to a boil, then simmer for 10 min. Strain pepper flakes and ginger liquid. Keep the liquid in a cup. 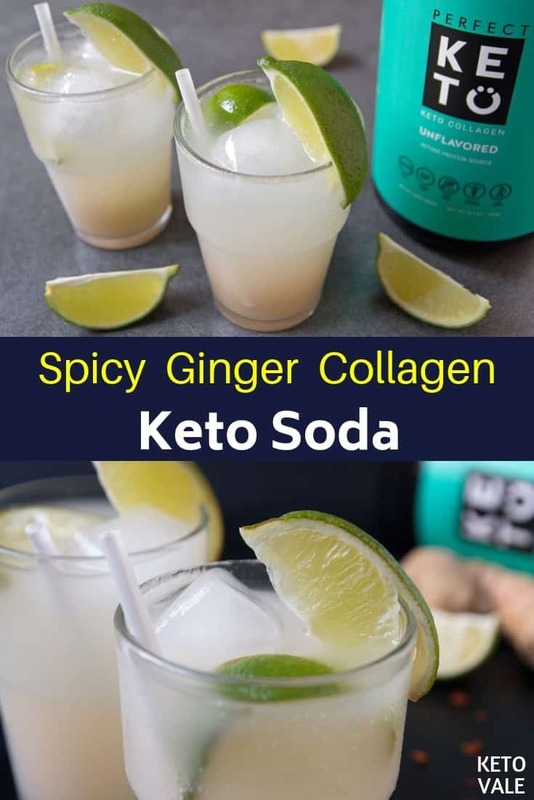 Add 1 1/2 scoops of Perfect Keto Unflavored Keto Collagen (you can choose other flavors) to the ginger-pepper mixture and stir to dissolve. Add a few ice cubes in a glass then pour the collagen mixture in. Add the juice of a lime (or lemon) wedge into the glass then add soda water and stir and serve! You can also make carbonated water from home by using this SodaStream to make your own sparkling water. 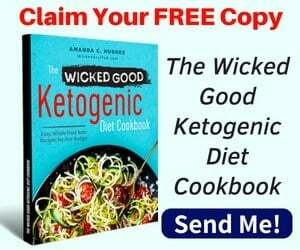 In a saucepan combine erythritol, minced ginger, red pepper flakes and a cup of water. Bring to a boil, reduce the heat and simmer for 10 min. Strain ginger liquid and let to cool. 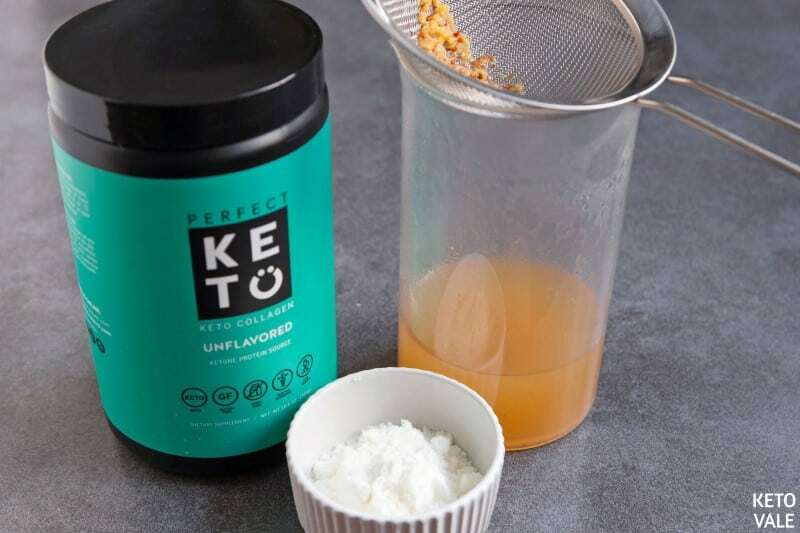 Add 1 1/2 scoops Perfect Keto Unflavored Keto Collagen to the ginger mixture and stir to dissolve. Fill 2 glasses with ice cubes and divide ginger collagen water between them. 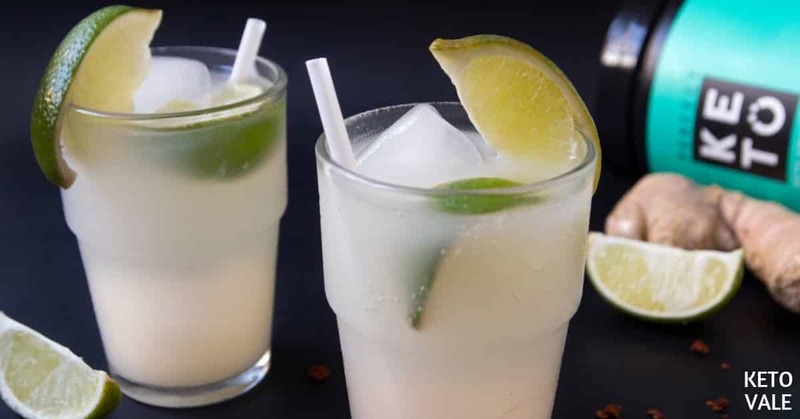 Squeeze a lime wedge into each glass and add soda water and stir.